Application Software is software for specific purpose, so we can say that software developed for user's purposes is called Application Software. This is developed by using High Level Language in the form of creative project work by the software industries. 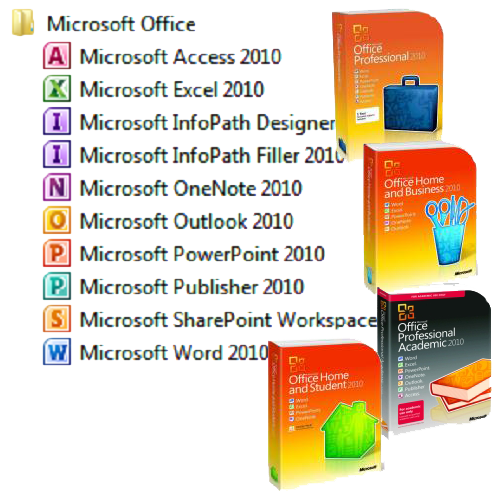 Word Processing: MS-Word, Word Perfect, Word Star etc. Spreadsheet: MS-Excel, Lotus-123, Quartto etc. Database Management: MS-Access, dBase-IV, Clippers, Oracle, OMNIS, Ingress, Integra, FoxPro, SQL etc. Graphics and Presentation: MS-Paint, MS Powerpoint, CorelDraw, Adobe PhotoShop, Adobe Illustrator etc. Animation: Macromedia Director, Macromedia Flash, Adobe Image Ready, Adobe Premiere, Adobe after Effect etc. Web Designing: Macromedia Dream weaver, Microsoft Front page Express etc. Packaged Software: Packaged Software is ready made, error free , advance and standard software for general works. All word processing, database. Management, graphics and representation, animation, web-designing software are packaged software. This software is equipped with essential tools and technology to enhance user productivity. Tailored Software: Tailored software is small software, developed by using high level language for specific small process. These types of software are developed for certain specific purpose. Example: Software for Payroll for Specific organization, Software for specific Bank, Software for Railway Reservation, Hotel Reservation etc. This software is developed for solving specific problems of specific users or organizations. Software developed for user's purposes is called application Software. Word Processing,Spreadsheet, Database Management, Graphics and Presentation, Animation and Web Designing are the software available for user purposes. Packaged Software and Tailored Software are the types of Application Software. All word processing, database. Management, graphics and representation, animation, web-designing software are packaged software. Tailored Software is developed for solving specific problems of specific users or organizations. Write short note on OMR. Optical Mark Reader is an input device which can recognize & count a pre-specified type of mark made by pencil or ball pen. It is mainly used for counting the (?) tick mark or shaded circles in the object type question paper. Write short note on track ball. Track ball is an input device similar to mouse which contains one or more buttons and a ball. The ball is only the movable part of track ball which is used to move the cursor one the monitor of the computer. Write short note on touch pad. Touch padis touch sensitive pad used as an input device commonly used in laptop computers. This device works by sensing the user's finger movement and down ward pressure. Write short note on microphone. Microphoneis an input device which is used to input the voice or sound into the computer. Microphone is very popular device nowadays also used for voice chatting over the internet & video conference. Write short note on graphic digitizer. Graphic digitizer is an input device which is also known as digitizing tablet or touch tablet which is pressure sensitive device mainly used in Computer Aided Design and graphics applications. Write short note on joystick. Joystickis a small hand-held input device which is similar to gear lever of motor cars. This device is mainly used to play computer games with the help of control buttons. Write short note on touch screen. Touch screen is a direct entry input device which contains special sensors on it. When the user touches the object on screen it recognizes the touch and produces reaction accordingly. Distinguish between package software and tailor software. i. They are generalized set of programs i. They are special set of programs. information about the computer system. Application software is developed by using ______. A small software, developed by using high level language for specific small process is ______. _____ is ready made, error free , advance and standard software for general works. MS-word is an example of ______. Which of the following is an animation? Any Questions on 'Application Software '?